Hurray!!!!. I have come to my 50th post with an award. I really like to thank all of you for giving me encouragment with such lovely comments. I also thank my hubby and my sweet little princess for their kind co-operation. I started my blog inspired by seeing all the food bloggers. It's very nice to share my recipies with you all and getting a very encouraging feedbacks. Definitely I have to speak about the awards particularly. Such lovely and cheering up awards which is a source of huge inspiration. I have got lots of friends in this Blogging world. My heartfelt thanks to one and all. With one cup of coconut milk add one cup of water . Allow it to boil. At this stage, add the roasted rava to it slowly by stirring continously, so that no lumps are formed. When they start to boil, add the remaining one cup of coconut milk to it.Add the color and stir it well. When the rava seems to be cooked add the sugar and mix it well. OPTIONAL: AT THE FINAL STAGE ADD 2 TSP.CHANNA DAL FLOUR ROASTED IN GHEE TO INCREASE THE TASTE OF KESARI. Adding Milk to Rava called as "Milk Kesari"
Adding Coconut milk to Rava called as "Malabar Kesari"
Adding condensed milk at the final stage called as "Bengal kesari"
Adding Fruits like Bananas, Mango, Pineapple at the final stage called as "Fruit Kesari"
My heartly congrats to you.....nice recipe to celebrate the joy !!!!! Hey Congrats on your award and for your 50th post too dear. Wish to achieve many more like this. Nice recipe too. Hey, I stumbled here through Priya's spot. Congrats on ur 50th post. I love kesari. Swing by my spot when you get a chance. Congrats on your 50th post and that well deserved award dear. Thanks for sharing it with u all. Malabar kesari looks delicious dear. COngrats Aruna..keep rocking and congrats on ur award..Kesari looks fabulous!!! Wow.. congrats dear! Thanks for the award dear! Delicious kesari da! Congrats dear and thanks for your lovely comments :) and thanks for this award. The kesari looks so yummy and tempting. Congrats on your 50th post and award..
Aruna, Kesari has come out so well. Love the colour. Wish to see more posts coming from you!! congrats on ur 50th post.kesari looks amazing..Never heard of addind coconut milk to itand nice to know abt different types of kesari. Thank you Aruna for sharing the award with me.Milk kesari looks yummy! hey aruna...congrats on your awards.and thanks for stopping by at my blog and for the wonderful comments.. Congratulations!! Wish you many many more! 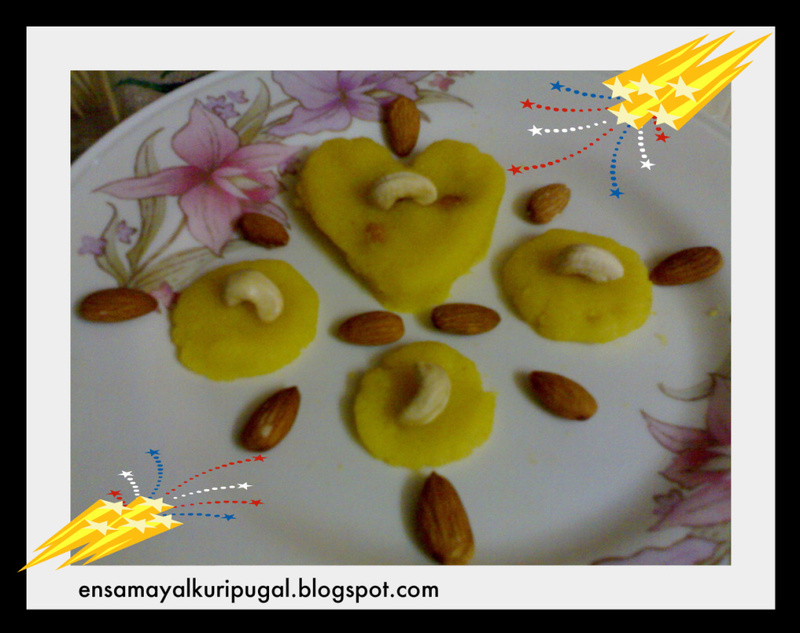 Rava coconut milk kesari looks lovely! Dear Aruna,Congratulations on your 50th post and your award. 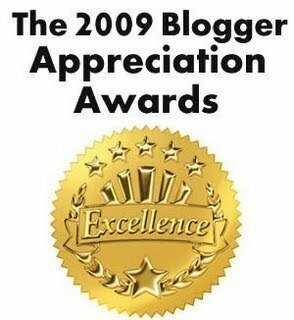 Kind of you to stop by @ my blog and give me an award. 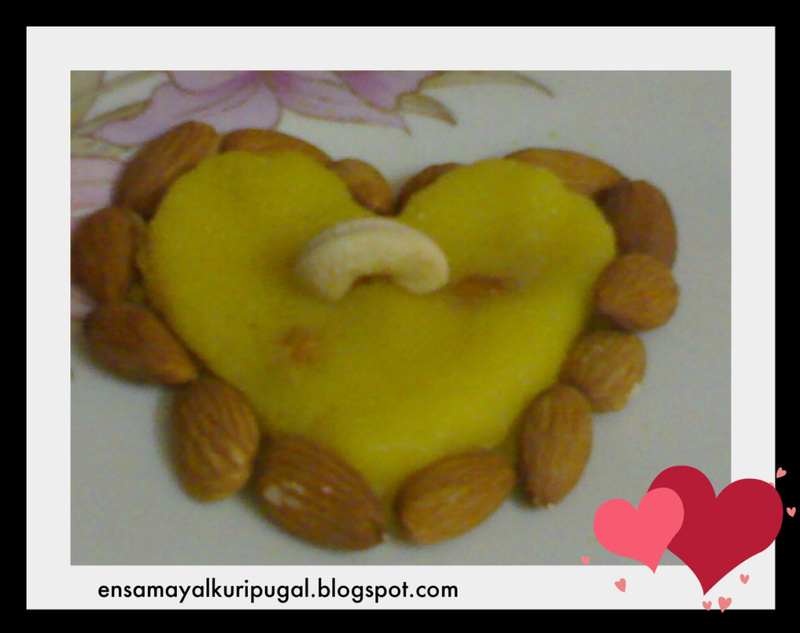 Did you know that is going to be my 25th post and I'll celebrate it with your award and a sweet recipe.Thanks a lot. This award will always be special, as its my 1st. Your Rava Coconut Milk Kesari looks really awesome. Great Presentation. You have a beautiful blog. Looking forward to many more delicious and mouth watering recipes. Congrats for your 50th post and wonderful award ! congrats for your 50 th post. 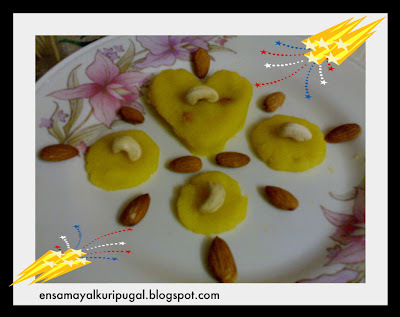 and nice receipe ..
got here from ur comment on my blog.looks like u were on to welcome me with a sweet dish :).congrats on ur milestone and may u have many more of those. Thank you for gave me an award..
What a wonderful recipe to mark your 50th post! Congrats on the award! Congratulations!! Heartful wishes to you. Keep it up Aruna.